Our ears are complex and highly sensitive instruments that allow us to hear. This is why we should take care of them and protect them from the damaging, long-term effects of loud noise. The best way to protect your hearing is to avoid loud noise. But we understand that this isn’t so easy, especially if you work in noisy environments like construction sites and factories. Your employer should make sure that you have the proper protection to work safely. But more and more young people are being affected by hearing loss. Listening to personal music devices, going to concerts, festivals and clubs all make a big difference to your hearing. Try to avoid standing too close to speakers and use reusable earplugs the next time you’re at a gig. Hearing damage can start at around 85 decibels (dB) when you’re exposed to it for 8 hours or more without hearing protection. After that, for every noise increase of 3 dB the exposure time cuts in half.  For example, you can only be exposed to 88 dB sounds levels safely for 4 hours, 91 dB for only 2 hours, and so on. Custom fit hearing devices provide an individual and unique fit with guaranteed levels of protection. Produced from impressions taken of the ears, custom fit hearing devices are made from soft, medical-grade silicone so users can wear them for longer than standard earplugs, with greater levels of protection. They’re specially designed to fit your unique ear shape for a better, more comfortable fit. There are a variety of options from general use to specialised products for specific purposes, available in a choice of colours and guaranteed for one year*. Custom hearing protection is available from just €115.95. Ask in-store for details. *Non-faulty goods cannot be returned. Remakes due to poor fit can be returned for remake in 30 days. Wind and engine noise are a constant problem for motorcyclists, and can seriously damage your hearing. Our custom hearing protection is guaranteed to combat the irreversible damage that could be caused by the sound levels while riding a motorbike. They are designed to fit comfortably without restricting your helmet. Effective blocking from water, these earplugs fit deep into the ear canal and cover the bowl of the ear. This protection prevents water from entering the ear canal causing infections. The silicone used does not shrink or harden and options are available which allow them to float. Comfortably protect your ears without spoiling your enjoyment of the music. And, if you’re working with customers, you will still hear clearly what they’re saying over the high levels of sound. Musicians’ earplugs reduce ambient noise, so the fidelity of the original music is preserved with no loss of clarity. Originally designed for military use, these custom earplugs incorporate state-of-the-art passive impact noise filter, for the best protection for shooting or other pastimes where noise can suddenly be instantaneous. They also allow instructions, conversations and alerts to be heard. DIYers are at risk when drilling, grinding, sanding or using any other power tools during home maintenance or vehicle repairs as constant levels of noise above 85dB can damage your hearing. These custom fit earplugs are both comfortable and offer peace of mind that your job or hobby is not affecting your hearing. Sleep problems can be caused by a multitude of things like snoring, noisy neighbours or noisy environment, maybe just an irregular work pattern, which can cause profound stress just when you want to relax. Shut out the world and indulge in a good night’s sleep with these custom earplugs. Advances in technology mean the latest generation of instant fit devices are now more effective and comfortable than ever. They are reusable and available in six variants and are each designed for use in specific environments. Perfect for all water sports, they prevent water entering your ears, reducing the risk of infection, while still allowing you to hear ambient sounds. Block noise from traffic, noisy neighbours and snoring while helping you to have a peaceful night’s sleep. Help prevent hearing damage when using power and garden tools, including chainsaws, grinders or mowers. Grinding wheels, linishers, band saws etc. An advanced filter provides open-air passage to the ear for ventilation while reducing engine and wind noise. Certified up to 166dB, they protect your ears from the peak sound pressure level of gunshots or other impact sounds reducing them to safe levels. When no sound peaks are present, voices and background noise can be heard. Ideal for concertgoers, clubbers or those that simply want to enjoy loud music situations at a safe hearing level. Some handy tips on how to insert and clean your earplugs. Make sure your hands are clean before you handle your earplugs. Roll the earplug into a narrow tube. Slightly pull your ear up and out a little bit – this will make it easier to insert them. Your ear canal will have opened up a bit, so it will be easy to gently insert the earplug, making sure it is well inside your ear, but not too far down that you have to force it. There should still be a small amount sticking out so that you can easily grip it to remove later. Regularly removing the build up of earwax and oil from your earplugs will make sure that they stay flexible and effective. Put your earplugs in warm water with a little soap added. Remove the dirt by gently rubbing them with your fingers or by using a soft cloth. Make sure you’ve washed off all the soap, and leave them to dry on a clean towel.